MUNDELEIN, IL--(Marketwire - November 24, 2008) - Medline Industries, Inc., the nation's largest privately held manufacturer and distributor of medical supplies, announced today the opening of a new state-of-the-art 400,260 square-foot distribution facility in Shepherdsville, Ky., near Louisville. Located in the second fastest growing county in Kentucky, the new facility is expected to employ 50 people on two shifts and serve healthcare customers in Kentucky, Indiana and portions of Tennessee. 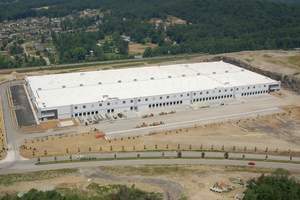 The new facility is designed and built to the latest building standards and distribution logistics. It features a flow-through layout (incoming deliveries are delivered at one end of the building and outgoing shipments on the other end) with 45 receiving dock doors and 45 shipping dock doors and narrow-aisle configuration, maximizing the efficiency of the facility. The first customer order was processed and shipped from the facility on September 29. "Our business is steadily growing throughout the country, especially in the south and southeast regions," said Bill Abington, Medline's president of operations. "This world-class facility will provide outstanding service to our customers who depend on the timely and consistent delivery of our medical supplies to help care for their patients." The distribution center also utilizes efficient "green" technology. Motion sensors are combined with advanced high-output, energy-saving lighting to keep lights off in aisles when not in use. A white ceiling and a high-shine floor maximizes the lighting output. Energy-efficient fans improve air flow and help control condensation while providing associates with a cleaner, more comfortable work environment. The opening gives Medline a total of 34 distribution centers in the U.S., including Alaska, Hawaii and Puerto Rico. Medline, the nation's largest privately held manufacturer and distributor of healthcare products, manufactures and distributes more than 100,000 products to hospitals, extended care facilities, surgery centers, home care dealers and agencies and other markets. Headquartered in Mundelein, IL, Medline has more than 800 dedicated sales representatives nationwide to support its broad product line and cost management services. Meeting the highest level of national and international quality standards, Medline is FDA QSR compliant and ISO 13485 registered. Medline serves on major industry quality committees to develop guidelines and standards for medical product use, including the FDA Midwest Steering Committee, AAMI Sterilization and Packaging Committee and various ASTM committees. For more information on Medline, visit our Web site, www.medline.com. Medline's new state-of-the-art 400,260 square-foot distribution facility in Shepherdsvilles, KY opened on September 29.